A typical OpenID transaction has three parties involved: the user, the OpenID provider (OP) and the webapp that request authentication, called the relying party (RP). 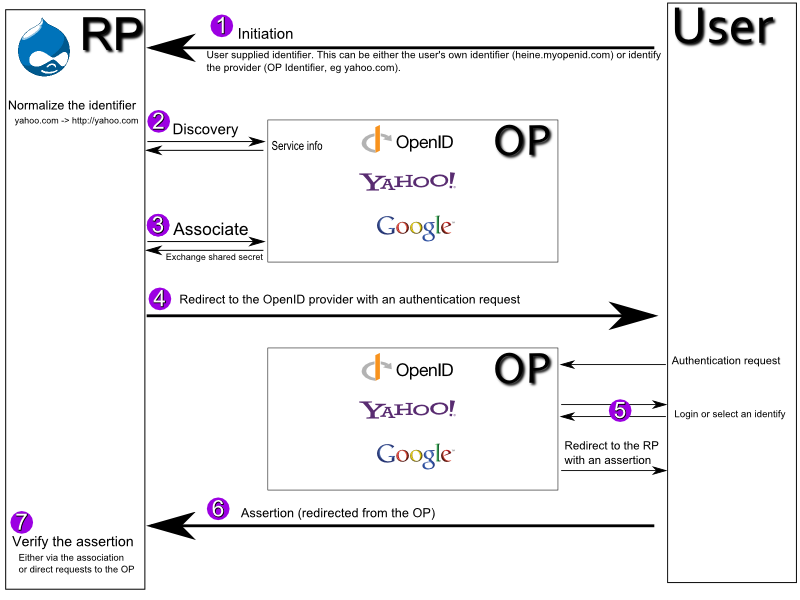 Here, the RP is Drupal, and the OP, or OpenID Provider is Gmail, Yahoo, Live or MyOpenID. The user kicks off the process by providing an identifier to Drupal. This user-supplied identifier can either be his own identifier (heine.myopenid.com) or identify the OpenID provider that should be used (yahoo.com). A user-supplied identifier that identifies the OpenID provider is called an "OP Identifier" in the spec. We can distinguish between the different identifiers after having performed the Discovery step. If the identifier is an XRI, Drupal should do XRI resolution that will deliver an XRDS document. If the identifier is a URL, Drupal uses the YADIS protocol to fetch an XRDS document. It's a bit hard to describe each and every discovery method, so I'll just go into detail on XRDS based discovery via XRI or Yadis (section 7.3.2), as this is the method used by Google (vulnerability was discovered using Google OpenIDs). Drupal knows whether the user-supplied identifier is describing the user or the OpenID provider by following a series of steps. First, Drupal should search throught the XRDS document, trying to find whether it contains an OP Identifier element which is a Service element, containing a Type tag with the text content "http://specs.openid.net/auth/2.0/server" and a URI tag (the text content is the OP endpoint URL Drupal must use to do authentication requests). If Drupal cannot find this OP Identifier element, it should try to find a Claimed Identifier Element which is a Service element, containing a Type tag with the text content "http://specs.openid.net/auth/2.0/signon", a URI tag (containing the OP endpoint URL as above) and an optional LocalID tag (an identifier used by the OpenID provider to identify the user). As you can see, the example code above doesn't contain an OP Identifier Element, but a Claimed Identifier Element. The response by Google, below contains an OP Identifier element; the Identifier describes the OpenID provider, not the user. The OpenID provider will allow the user to choose an identity when authenticating (ie which gmail account to login with). As I wrote above Drupal should search for an OP Identifier Element, and only then for a Claimed Identifer Element. Right now, Drupal just looks at the first services entry. This issue has been filed under #579448. These Identifiers should be used when doing authentication requests (Step 4 in the image), EXCEPT in the case of an OP Identifier. Then Drupal should use the the special URL "http://specs.openid.net/auth/2.0/identifier_select" as BOTH the Claimed Identifier (openid.claimed_id) and the OP-Local Identifier (openid.identity). The vulnerability stems from the fact that Drupal doesn't use this URL for the Claimed Identifier during authentication, causing undefined behaviour in the OP. That's all for now; steps 4-7 will have to wait for Part II. Heine - thank you for this detailed writeup. I'll see you in the issue queue. Looking forward to subsequent posts.